Updated Tuesday, June 13, 2017, 1:20 p.m. EDT: The Golden State Warriors have not made an official decision about whether or not they will be going to Donald Trump’s White House. 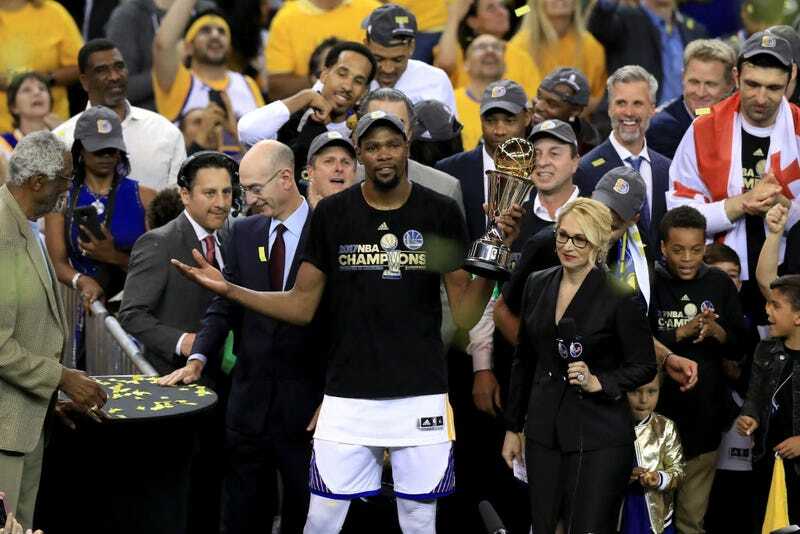 According to a statement issued by the organization, the newly crowned NBA champs noted that they haven’t even received an invitation from the White House. Because Trump has already heard that the Warriors don’t want to come to his house of misogyny, xenophobia and racism, he won’t invite them. If they do receive an invite, they won’t show. Amid rumors that the Warriors planned on snubbing a presidential invite to the White House, House Minority Leader Nancy Pelosi offered to host the NBA champs at the Capitol. So we’ll all be waiting to see what the Warriors brass decide, but if they receive in invite to the White House, I highly doubt that any Warriors will accept. The Golden State Warriors beat the Cleveland Cavilers in just five games, and the entire team is the real MVP as reports have surfaced that the 2017 NBA champs won’t be making the customary trip to the White House because the president is a xenophobic, racist dirtbag. Josh Brown of CNBC’s The Halftime Report tweeted shortly after the Warriors won their second title in three years that the team decided unanimously to skip the traditional championship visit to Washington because of the president’s hatred of all things that basketball represents, like teamwork and black men and smiling. “The Warriors will be the first team to boycott a visit to the White House following a championship. After the New England Patriots won the Super Bowl earlier this year, some members of the team skipped the visit, but the likes of head coach Bill Belichick, owner Robert Kraft, tight end Rob Gronkowski and others still attended,” TSN reports. The Pittsburgh Penguins recently won their second Stanley Cup Championship Sunday, and there has been no word on whether the team plans to make a trip to the White House.